Commenting has gotten a bad rap over the years, as many venues on social media and news sites have become breeding grounds for trolls. This has led to a belief in some corners that good commenting isn’t possible, can’t occur at scale, and that given all this, maybe scholarly publishers should just avoid it, despite examples of approaches that have worked, at least one for well more than a decade. Commenters are qualified by education, publication, and membership criteria. Before anyone can make a public comment via Remarq, their educational, publication, and membership credentials are validated by the system. If they are not adequate, the comment is held and the user can apply to update their credentials, which are then evaluated by human moderators. Commenters are identifiable. In addition to validating their qualifications, Remarq ensures the individuals are who they say they are, and preserves this identity, all of which increases the pressure to behave responsibly. Comments can be moderated before or after publication. Remarq allows publishers and editors to establish the comment moderation policies they wish, and our administrative tools make moderation a breeze. Authors and editors have unique roles in commenting. Unlike other systems, Remarq allows authors of the article in question and the editors of the journal being used to issue special comments, called Updates, that have extra status across the system. This conveys familiar authority, and reinforces the presence of these important people in the community. 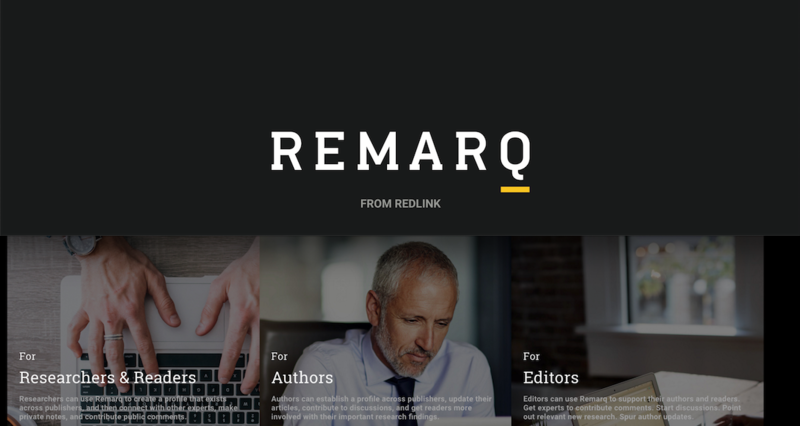 More importantly, Remarq supports author-editor interactions, with editors moderating author updates and potentially collaborating further based on the content of the update. Updates from authors who have added or expanded citations in their original articles. Comments reinforcing the importance of archival articles. Users adding links to additional, relevant data sets. Users asking substantive questions of authors, and authors answering. Perhaps most imporantly, Remarq offers many ways to engage with content — private notes and highlights, legal article-sharing, connecting with colleagues and collaborators, and more. Users actually prefer these private and semi-private modes of engagement, with comments being less frequent modes of interaction. The ratio so far is about 15:1 of private notes to public comments. What’s next for commenting on Remarq? Comments that can be cited. Look for this feature coming in a future release. For more information about improving editorial engagement for authors, editors, and users, please contact us.